I've heard this is excellent. It's not my usual genre but I want to give it a try. I was surprised I would enjoy this one; after all, a flesh-eating horse sounds a little ick to me, but man! I was pulled in immediately and fell into lock-step with it all. The story was incredible and the narrators were the icing on the cake. Sounds fantastic. I really need this one. Great review. Thanks, Juju! Hope you enjoy it. Never heard of this author, but I agree that a well-done audio book can take a story to new levels of interest and understanding. This is my first time reading/listening to the author and I know other bloggers loved her Shiver Trilogy quite a bit. I'm still hoping to read that one and it looks like she has a new one coming out soon that is the start of a different series called The Raven Boys. I'll be looking for that one! Rhapsody Jill RAVED about this book. I'd heard that this author's trilogy on audio was not so good (the narrator really bothered some people) so I didn't even think to see if my library had this one. Which is stupid because it is not the same narrator! I'm convinced. I'm going to see if they carry it. I loved Jill's review! I've been debating on getting the Shiver Trilogy on audio or printed, and I'm not sure which one to go with. The Audible.com reviewers seemed to enjoy it, but I think I actually have Shiver already on my shelves so I might need to read it first! The Scorpio Races have absolutely fantastic narrators! I am definitely putting them on my "must listen to them more" list. I just found that Steve West did one of the Jo Nesbø books! Score! I absolutely loved this one too - now I wish I had listened to the audio! Oh, the audio is fantastic! If you get a chance to visit this one again, try the audio. If you enjoy audio, do try to see if you can get it that way. It was a great listening experience! Good luck! Steve West is totally hot hot hot! I didn't listen to it, but I could love imagining him as Sean while I listened! :--) By the way, this coming Sunday, I am posting pictures of my experiment making November Cakes! I have been waiting for a really thorough and involving review of this one, and now that I have read yours, I think I need to grab this book as soon as I can! It does indeed sound like a powerful story, and like one that I would love. You did it excellent justice in this review. I think I will go with the audio as well! Great thorough and interesting review. I really love the sound of this, you have totally sold it to me! Thanks for the insight, I'm definitely going to have to read this ASAP! I've never heard of this one by this author. I've got to check this out! I would really like to give this one a change. I don't listen to audiobooks but I might give it another chance. I absolutely LOVED this too, although I read a hard copy instead of the audio book. 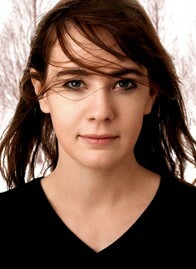 I'm thinking about checking out some of Stiefvater's other books. This one is on my TBR too, so I've only half-read your thoughts to avoid any spoilers. I do agree, though, that there is something particularly compelling about listening to this kind of story; I'm fairly new to audiobooks, too, but I listened to The Hunger Games and found myself listening at every single opportunity, not only on longer walks and with longer waits, but even for a minute or two!